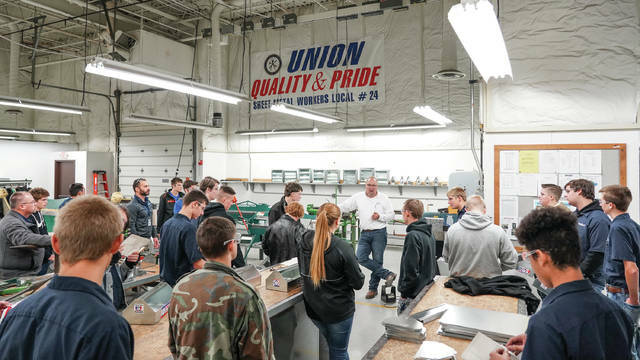 DAYTON — Upper Valley Career Center HVAC Students visited the Sheet Metal Workers Local Union 24 Training Center to learn about their apprenticeship program as part of the United States Department of Labor National Apprenticeship Week. SMW LU 24 Training Director Eugene Frazier, will be hosting a total of 140 local high school and career center students at their nationally recognized training center on Poe Ave. in Dayton throughout the week. “There are high-paying careers that do not require a four-year degree. The majority of our apprentices leave the program with a job earning over $28 an hour with zero debt and paid benefits,” said Frazier. National Apprenticeship Week (NAW) is a national celebration that offers leaders in business, labor, education, and other critical partners a chance to demonstrate their support for apprenticeship. The week-long event highlights the benefits of apprenticeship in preparing a highly-skilled workforce to meet the talent needs of employers across diverse industries.